Learning how to make a chocolate pudding recipe is one of the first desserts we learn how to make. A delicious pudding is one of the first things that pops in our minds when a creamy dessert is mentioned; it has to be chocolate because that is the favorite around the world. Many use the quick and easy method by mixing up a box of pudding mix and I might add they are quite good in taste. A bowl of this dessert topped with whipped cream is a great way to finish a good meal. This same pudding mix can also be used as layers of a trifle or between cake layers. Learning how to make a chocolate pudding recipe goes far beyond mixing up a box of pudding. At home this custard is made up of milk or cream, eggs and cornstarch or flour usually for thickening. Besides being just refrigerator desserts (mixing them up and placing in refrigerator), this creamy mixture could be a deep chocolate fudge recipe, a chocolate rice recipe or a chocolate bread pudding recipe. It could also be a steamed pudding recipe, a baked pudding recipe or even a frozen pudding recipe. As you can see the options for this luscious dessert are endless; and what better to have so many options for than our most favorite flavor in the world. You might also want to experiment with the different types of chocolate when learning how to make a chocolate pudding recipe. Semi sweet, bittersweet or milk chocolate gives the dish a different flavor; you will also find a difference in taste when using different brands of chocolate. Since chocolate and pudding recipes are so popular all over the world, try some of the recipes from other countries. For instance, some Spanish countries enhance their recipes with coffee and cinnamon adding very delicious and unique flavors. Combine the cornstarch, sugar, cocoa and salt in a heavy saucepan. Gradually add a little milk and stir to a smooth paste; stirring constantly add remainder of milk. Pour a little hot mixture into well beaten egg, beating while pouring. Add egg mixture into pan with remaining hot mixture. Return to heat and cook until pudding consistency. Refrigerate until cold and serve with whipped cream. A favorite pie of many chocolate lovers is the chocolate meringue pie. It is made with a luscious chocolate pudding poured into a baked pie shell and topped with a heavenly meringue. This chocolate pudding recipe came to me from a friend out West. It is more like a cake pudding and is great topped with whipped cream or ice cream. Mix ¾ cup sugar, baking powder, flour and salt; melt chocolate with butter and add to dry ingredients. Add milk and vanilla and mix well; spread in 9 X 9 inch buttered baking pan. Mix brown sugar, cocoa powder and ½ cup sugar together; spread over top of batter. Pour 1 cup cold water over top; bake 40 to 50 minutes. Set until cool and serve with whipped cream or ice cream. Combine rice, milk, water, sugar, chocolate, nutmeg and sugar in double boiler. Cook over boiling water for 2 hours until liquid is absorbed. Chill; serve plain or sprinkled with cinnamon and sugar. This chocolate pudding recipe is kept moist by steaming. Put 1 inch of water in a steamer or covered roasting pan or kettle. Place mold on rack and cover the steamer. Use medium or high heat until steaming begins, reduce heat to low keeping steam steady and slight. Sift flour, measure and resift with salt and baking powder. Cream butter adding sugar gradually mixing until light and fluffy. Add beaten eggs and cooled chocolate; beat thoroughly. Add dry ingredients alternately with milk beating well after each addition. Pour into a greased and sugared 1 quart mold; steam covered for 1 ½ hours. Remove from steamer and let stand a few minutes before unmolding; serve warm. When I was young, the only kind of chocolate pudding recipe many served in their homes was a chocolate bread pudding recipe. It was a way of using up old bread and have dessert too. Heat chocolate and milk in saucepan until chocolate is melted; add salt. Combine brown sugar and egg yolks; add chocolate mixture gradually while beating; add vanilla. Pour mixture over dried bread crumbs and let stand 15 minutes stirring occasionally. Turn into a buttered baking dish; set dish in pan of hot water in oven. Bake 30 minutes or until almost firm. Beat egg whites until foamy; gradually add granulated sugar while beating into stiff peaks. Pile meringue on top of bread pudding and continue baking until meringue is golden brown. 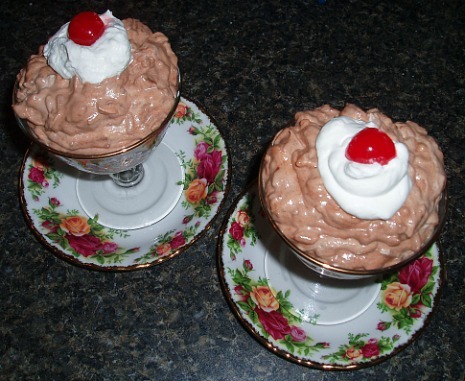 This frozen chocolate pudding recipe can also be called chocolate ice cream recipe. It is made with a chocolate cooked custard like pudding and then frozen in your refrigerator freezer. So delicious in the summer! Or any time! Combine sugar and cornstarch in top of double boiler; gradually stir in milk. Place over boiling water and cook stirring constantly until mixture thickens; cover and cook 10 minutes stirring occasionally. Stir a little of the hot mixture into beaten egg yolks; then stir back into hot mixture. Cook over hot water (not boiling) stirring constantly for 3 minutes; remove from water and cool. Beat egg whites until stiff; add salt. Fold whites into cooled custard; stir in vanilla. Pour into refrigerator freezer tray and freeze until firm throughout. Whip heavy whipping cream only until it holds its shape (too stiff will cause buttery texture). Remove frozen pudding from freezer and into a chilled bowl and break up with a wooden spoon. Beat frozen pieces with mixer until mass is free from hard lumps but still crumbly (too much beating and liquid will form). Fold whipped cream into frozen mixture; turn back into freezer tray and finish freezing.